You know you’re really on holidays when your feet first touch the sand on a long, empty beach. Take off your shoes, get the sand between your toes and walk, swim, fossick for shells or just lie back and snooze in the sunshine. The east coast has some of the most beautiful beaches on the planet, and the Great Eastern Drive will take you right there. With 220 kilometres of coastline, and a mild year round climate, you’ll find beautiful beaches to explore all along the east coast. Every coastal town here has a beach (or two, or three) waiting for you to discover. Just stop anywhere along the Great Eastern Drive—from the lovely Raspins, Shelly and Spring Beaches at Orford to the white sands of Binalong Bay and the Bay of Fires—choose a slice of bay that appeals to you, kick off your shoes and wander. The coast between Orford and Swansea has beautiful beaches facing onto Great Oyster Bay. Stop anywhere along this coast, including Little Swanport and Mayfield Bay, to explore. Nine Mile Beach, near Swansea is a must-visit, and the beaches of the Surf Coast, between Bicheno and St Helens, are perfect for walking, beachcombing, and relaxing. The Freycinet Peninsula has some of the best-known east coast beaches, including Wineglass Bay, considered one of the world’s most beautiful. 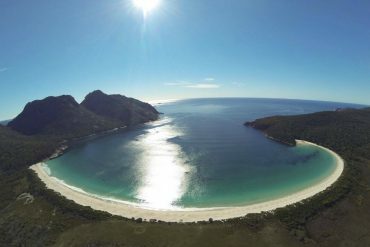 Take the one-hour return walk (1.5 km each way) to the Wineglass Bay Lookout. Take some extra time to soak up the view or descend to the beach to get your feet wet and spend a morning, afternoon or whole day relaxing on the warm, white sand or strolling at your own pace. Other beaches close to Coles Bay include Richardson’s Beach, Muir’s Beach and the incredible Friendly Beaches, a huge stretch of glorious coastline that is also the location for the Freycinet Experience Walk. The region’s best surf spots are clustered along the Surf Coast, between Bicheno (including Red Bill Beach) and St Helens Point. The beaches at Seymour, Chain of Lagoons, Four Mile Creek, Falmouth, Scamander and Beaumaris offer reliable swells year round, with crystal clear waves rolling into smooth white sand just about everywhere you look. The Bay of Fires is a must-visit walking destination on the east coast and is the location for the four-day Bay of Fires Walk, voted one of Australia’s best walking holidays. The beauty of relaxing is taking as long as you like to do whatever you like. You can walk for a few minutes or a few days on east coast beaches—just plan your visit to suit your own needs.